General Prosecutor Abdel Meguid Mahmoud on Monday referred charges of wasting public money and stealing Egyptian antiquities against Zahi Hawass, former minister of state for antiquities to the Public Fund Prosecution office. Nour El-Din Abdul-Samad, Director of Archeological Sites, had filed the accusations against Hawass, and requested that the objects in question be returned to the Egyptian Museum. The Public Funds Prosecution office also received other charges accusing Hawass of wasting public money and exposing Egyptian antiquities to stealing in collaboration with former regime members. 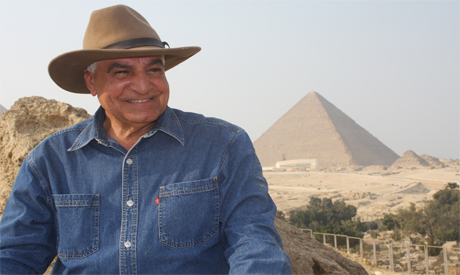 Hawass is accused of sealing a deal with the American Geographical Society to display rare Egyptian antiquities in exhibitions across the United States and Australia, violating the law of protecting antiquities. Hawass admitted in a television talk show that he had a 17 million dollar deal with the American Geographical Society with regard to a Tutankhamun exhibition to raise donations for Suzanne Mubarak's association, wife of former president Hosni Mubarak. Suzanne Mubarak's association was a private association not a state body, and as such Hawass was not legally allowed to use his position as a state minister to raise funds for it. The charges relate to Hawass agreeing to transfer and display 143 objects from the Egyptian Museum to Washington DC in 2003. The antiquities have yet to be returned to the museum. These exhibitions violate the antiquities law that prohibits renting Egypt's heritage. I was just contemplating writing an article about how very lucky the Egyptians are to have finally found someone they could trust, that was evidently very proud of Egypt and that was passionate about egypt and its wonderful artifacts namely Zahi Hawss. Being a life long lover of all things Egyptian I was glad to see there was someone who truly cared not to let the bad experiences of the past repeat themselves. Someone who was proud and strong and would fight for truth and honesty, and yet here we go again.It's sad to think he could end that way he seamed to bring Egypt into the light of the world for a while. What the new goverment is doing to him is criminal. He has brought so much attention to Egypt's past and has caused young people to get very interest in history once more. I am 58 years old so I have seen how the young has thought little about history. He feels and belives in what he is doing and had tried so very hard to get the return of artifices stolen from Egypt back to were thay belong in EGYPT. Please stop this witch hunt and let him do his Job that he loves. I personally get a bad vibe from Hawass. This man I believe has already excavated behind the Gantenbrink door and removed whatever was found. While he is in charge, we will never see the truth behind what is hidden in monuments such as the great pyramid. The sooner he is fully removed the better. What Else is Hawass Hiding? How many countless artifacts, that do not fit in with our traditional "story" of history - but reveal the truth behind our human condition - has Hawass been complicit in keeping behind locked doors and perpetuating the ignorance of modern man in regard to his own origins? How much important historical information has been suppressed, destroyed, or hidden by Hawass? A slur campaign has been launched against a dedicated person who has done so much for the Egyptian antiquities. His personality symbolizes Egypt more than anybody else yet it is unfortunate he is subjected to such harassment. In more congenial circumstances he would have been a successful aspirant for the Presidency. This traitor to the Egyptian people needs to be dealt with. He showed little respect for the people of Egypt, while making himself the big man especially with the west. The Egyptian people own the things of Egypt, NOT HIM. Now is payback time. Those artifacts belong to the whole of the human race, not just Egypt! It was all of out ancestors who created those! We are talking about human history!!! These are baseless "charges" relate to the traveling Tutankhamun exhibition which long, long ago left Washington D. C. and is no longer even in the United States- so much for truth. As for the charge that "these exhibitions violate the antiquities law that prohibits renting Egypt's heritage," long before Zahi Hawass was in charge Egypt sent out traveling exhibitions and they are still circulating now with the proceeds going to the SCA, as they have always done.